Earth-moving plant is commonly used on construction sites to transport and place excavated soil. 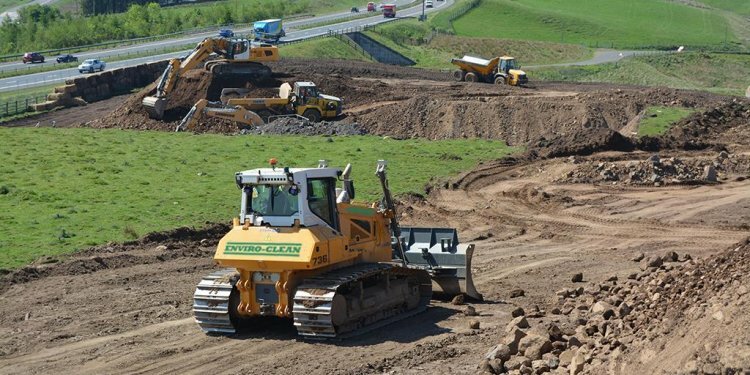 Before beginning earth-moving works, there must be a plan for the amount of material that needs to be moved as well as where it will be moved to. The quantity of material to be moved. The distance to be moved. The speed and turn-around time required. The size of the excavating bucket. Hydraulic tipping skip mounted on 180-degree slewing turntable. Otherwise known as crawler tractors, bulldozers are track or wheel-mounted with a forward-facing mould blade controlled by hydraulic rams. The blade is capable of tilting about a central swivel point, allowing for a dipping depth of 300 mm. This means they are commonly used for stripping sites, reduced level digging and pushing earth from one point to another. Bulldozers are also used for clearing vegetation and small trees, acting as a towing tractor and can be adapted as an angledozer which pushes and casts spoil to one side of the mould blade, avoiding side spillage when pushing material forward. A four-wheeled scraper unit is towed behind a track-mounted machine. This is a slower option but suitable for medium-sized sites with poor ground conditions. Graders are similar to bulldozers in that they have a long slender mould blade which is used for the bulk movement of earth. Graders can either be four-wheeled or six-wheeled (two at the front, four at the rear). The adjustable blade is fixed under the centre of the machine and can be raised and lowered in both horizontal and vertical planes through an angle of 300-degrees. A horizontal blade allows for the finishing of earth formations such as to a fine limit, whilst a more vertical blade allows for the cutting, shaping and grading of embankments. Otherwise known as loaders, these machines have a front-mounted shovel bucket (similar to a multi-purpose excavator) which is used to scoop up and raise loose spoil before depositing it into a transport vehicle such as a dumper. They can be either tracked or wheeled, which means that they are suitable for most types of ground condition and commonly have a bucket lifting height of 4.5 m.